ON the deck of his noisy little tin pot steamer the "Explorer." Lieutenant Joseph C. Ives stood in the hot May sunshine of 1857 anxiously scanning the happy, noisy crowd of Mohave Indians, clustered along the hanks of the Colorado river. 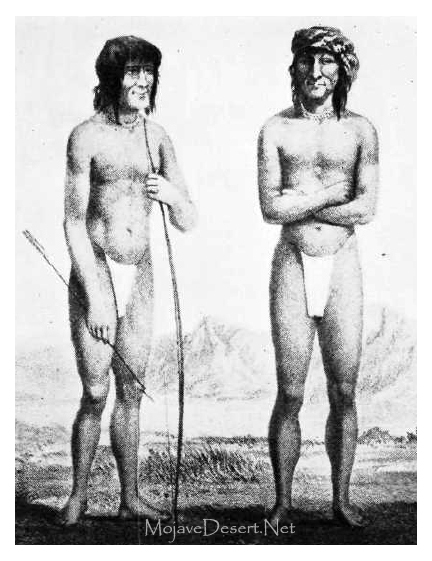 Ives was hoping to see two friendly faces in that naked throng, two Mohave men who were well known to him, the faithful guides of Lieutenant Whipple in 1854, Cairook and Irateba, the most important leaders of the Mohave tribe. "You know um Cairook and Irateba?" Mud plastered heads of shy river Indians nodded yes and no. Cairook. yes. "Him across the river. Him come bimeby." Irateba? Black eyes roved restlessly one to the other. Irateba? They did not know him by that name. On the edge of the throng sat a tall, well formed man, naked save for a breech clout. Now and then his eyes turned toward the white men in the midst of the animated throng. Ives caught one of the roving glances. The seated figure rose to six feet of bronzed Mohave manhood. A shy smile of recognition crossed the strong brown face. Ives pushed through the crowd and held out his hand. He had found Irateba, one of the two men he sought to aid him in his exploration of the desert lands that lay on either side of the tawny flood of the swirling Colorado. Piloted by Irateba, Ives entered unknown terrain on the eastern shore of the river. When at last the party penetrated mountains strange to the Mohaves, Irateba and his friends turned back, loaded with presents and carrying with them the good will of the Americans. The following year Cairook and Irateba were actors in one of those inexplicable frontier tragedies. One muggy afternoon, early in August, 1858, a party of Iowan emigrants, the first wagon train over B?ale's new road, rested in the shade of the cottonwoods prior to crossing the Colorado into the Promised Land of California. The men, weary after a morning occupied in making the wagons ready for the river passage, sprawled in the shade of the vehicles taking a much needed siesta. Two little girls sat playing with their dolls. One of the girls was removing the glass beads from a pair of Indian moccasins obtained in crossing the southern plains. All was quiet with the sultry stillness of midday heat. Then quite suddenly death rode out of the leafy river undergrowth on a flight of fire hardened Mohave arrows, and the heavy air throbbed with the clamor of Mohave war cries. There had been some difficulty when the train reached the banks of [he stream. The Mohaves had demanded and received gifts in payment for passage through the Indian lands and the white men thought the matter settled. However, the Mohaves decided that here was a group of defenseless men. women and children with many fine cattle, wagons and other valuable plunder. Why not slay the white intruders and take all their belongings? The dazed midwestern farmers stumbled to their feet and returned the fire with ready rifles. Brown, leader of the wagon train, who had been outside the camp with a timber cutting party, spurred his horse through the attackers, leaped the lowest point in the wagon barricade and rolled into the dust under the cottonwood tree, his body feathered with shafts. "Rose," he gasped, calling to Leonard J. Rose, one of the organizers of the party, "Rose, where's my wife? I'm shot full of arrows . . ." and died. In the meantime the emigrants had recovered from the initial surprise and, maintaining a spirited fire, drove the Indians back. The latter rounded up the bulk of the emigrant's stock and drove the animals across the Colorado to the California shore. That night the dispirited group, under cover of the hot desert night retreated from the river, halting at intervals with bated breath. A renewed attack was expected at any moment. Overhead blazed a firy comet, which to the terrified survivors seemed an omen of doom. It is said that Cairook was one of the leaders of this attack. The result of this outrage was that Colonel Hoffman with a detachment of troops was despatched to Mohave territory with instructions to select the site for a post. His small command was attacked by the Indians and it is recorded that Irateba commanded the warriors in this skirmish. The Indian leader posted himself on a point of vantage in a mesquite tree. Observing that the soldiers had fixed bayonets and being unfamiliar with such a procedure, he shouted to his men: "They have stopped up the ends of their guns. They cannot shoot. Go in and give them the knife." This was a costly error on the part of the Mohaves and the Indians were soon dispersed by heavy musketry fire. This affray took place in January, 1859. Hoffman retreated, but in April he returned once more to the heart of the Mohave country with a force of 600 men. infantry and artillery. The Indians, awed by the display of force, were glad to sue for peace. Under a green arrow weed ramada. with freshly cut cottonwood logs as seats, blue clad troopers and breech clouted Mohave warriors, headed by six of their important leaders, Irateba, Cairook, Tomas, Capitaran, Carriou, and one other, unnamed, met in council on the morning of April 23. It was a windy day and the Indians coughed constantly. All were on edge and they became more nervous as they saw a cordon of armed soldiers gradually encircle the whole camp. However, the American officers managed to allay their fears and eventually the treaty of peace was concluded. The Indians agreed to allow the white men to build a fort in Mohave territory. White emigrants were to be allowed to pass through unmolested and in order that the whites might be sure the Indians would keep the peace, Hoffman demanded the surrender of nine hostages. The six chiefs volunteered to serve as such. It developed afterward they didn't know what the term hostage meant. Cairook is said to have acknowledged at this time that he was the ringleader in the attack upon the emigrant train. He was taken as one hostage. His nephew and the nephew of Irateba were also taken. Six more were selected and sent down on the river steamer to Fort Yuma where they were imprisoned in the guard house. Confinement irked the sons of the desert. It was a new and hated experience to them to be enclosed in a narrow room with small barred windows. They could not understand why the white men kept them shut up in a house. In desperation one of the captives begged a soldier guard to do him the favor to cut his throat and let him die. Then he would be free of the stifling room and the endless misery. The thermometer hovered around 118� in the shade that fatal afternoon of June 21, 1859, and the guards, feeling sorry for the poor devils cooped up in the guardhouse, allowed the prisoners to come out on the porch where it was a trifle cooler. A few hundred feet east of the prison flowed the broad muddy flood of the Colorado. Captive eyes gazed longingly at the murky waters. Cairook could stand it no longer. Suddenly he seized the musket of the nearest guard by the muzzle, then grappled with the soldier. The other prisoners immediately broke and ran for the river. The trooper wrenched free and lunged at Cairook, stabbing the Indian in the abdomen. Cairook staggered away on a faltering run. A Minie ball through his head tumbled him in the hot dust. The other guards began firing on the glistening black heads of the escaping prisoners as they swam frantically through the river currents. Four were slain, two were wounded but escaped with the other three who were never captured. Cairook's death left Irateba the undisputed leader of the Mohaves, which position he was to fill for the next fifteen years. After his accession to chieftainship of the Mojave nation, troubles between the white men and that tribe ceased and the people along the river gave Irateba all the credit. Gold fever swept the Colorado in the early '60s. Prospectors swarmed upstream and spread out across the arid lands of Arizona. New towns mushroomed into existence over night. Irateba remained staunch in his friendship and although the white men were engaged in war to the hilt with the Apaches, the Mohaves steered a neutral course, even aided the newcomers on occasions. In 1863 Irateba guided John Moss and William Furlong to gold fields beyond the Weaver and Walker diggings on the Hassayampa and a new copper district was named after him. 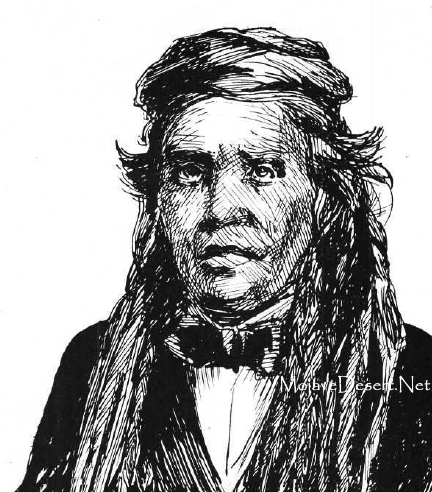 Moss was Indian agent at the time and he thought it would be a good idea to take Irateba on a trip to the east to show him the power of the Great White Father, thereby making the Mohave leader an even more powerful ally. Accordingly, on December 2, 1863. Irateba and Moss arrived in San Francisco on the steamer Senator from Los Angeles. Irateba was good copy for all the newspapers of the Golden Gate city. He was referred to constantly as the 'Big Chief or the 'Big Injun'. He had the run of the city and was invited to all sorts of functions. He stayed at the Occidental Hotel and ate his meals at the "What Cheer House." He was garbed in somber black and wore a tall light felt sombrero. On January 13 Moss and Irateba sailed for New York on the Orizaba. On a lovely summer morning. Fare thee well old Irateba." And inquired the hour for dinner. What he said of Mr. Lincoln. You shall hear from us hereafter." In truth it was time Irateba was returning home. The Mohave tribesmen were growing restless. All sorts of rumors were drifting like smoke among the arrowweed and mud rancherias of the Indians. Irateba had been imprisoned. Irateba had been shot. The white men had poisoned him. Wipe out the white men before they destroyed all of the Mohaves. Then Irateba, arrayed in all the glory of a major general's uniform with a cocked hat on his head, his chest ablaze with various medals, including one about the size of a 'dobe dollar set with colored stones and inscribed, "IRATEBA TEBA. CHIEF OF THE MOHAVES, ARIZONA TER.," revolvers in his belt, a long Japanese sword at his side and his pockets stuffed with daguerreotypes of Washington politicians rattled out of the west in an army wagon and all was peace on the river. Oddly enough Irateba's trip acted as a boomerang on his prestige. The uniform and the young arsenal he carried awed his followers but when the old leader began relating his experiences his stock fell to zero. In short, who could trust a man who told so many lies? Early in March, 1865, the Mohave slew a Paiute medicine man for failing to cure some small pox patients. In retaliation the Paiute killed two old Mohave women and the feud was on. In September word was received that a band of Paiutes were on their way down the river to attack the Mohave stronghold on Cottonwood Island. The Mohaves decided to carry the war to their enemy and Irateba, as befitted a leader of his people, sallied forth in all the glory of his Major General's uniform at the head of his warriors. The Mohaves had borrowed a dozen shot guns from some of the miners at Hardyville, and about a dozen of the latter went along to see the fun. In their ignorance and eagerness the Mohaves unlimbered the shotguns at long range on the Paiutes, whom they met about twenty miles north of the Island. The Paiutes retorted to the shotgun bombardment with gestures "more forcible than elegant" and then closed in with arrow, knife and war club. The Mohaves lost their nerve and fled. The Paiutes raced after them and there was a running fight all the way to Cottonwood Island. The Mohave warriors arrived there in time to send the women and children to the protection of Forl: Mohave, while Irateba and two of his head men remained behind to destroy the crops to prevent the Paiutes from enjoying them. While thus employed the enemy caught them and then it was that Irateba suffered the crowning insult that virtually destroyed what little remained of his prestige. The Paiutes were itching to lift old Irateba's scalp but they feared the wrath of the blue coated soldiers. Irateba was a friend of the white man. So, they did something, which, from the Indian point of view was even worse than death. They stripped Irateba of his glittering regimentals and put them on their own chief "Sic-a-hoot". Then they chased Irateba home in his birthday suit. It was all very embarrassing and Irateba was very, very angry. So much so that the following year the Mohaves again met the Paiutes and whipped them. "The old man is here now with his tribe, but he looks feeble, wan and grief stricken. Age has come to Irateba but it has brought to him no bright and peaceful twilight. Dark and cheerless appear the skies of his declining years." During the height of his power, Irateba was considered worth a regiment of soldiers to the white men living along the Colorado and in his old age, the white men respected him and mourned his loss when he died. Death overtook Irateba on a bright May morning in 1874. He was about sixty years old. Following tribal custom, Irateba's remains were cremated and today, no one knows where his ashes lie. A trail, a mountain and a mining district were given his name, yet who remembers him today? Irateba, the 'Big Injun', grand old man of the Mohaves. Irateba, Chief of the Mohaves when the soldiers first came to the valley of the Colorado river. Sketch was drawn by Gloria Widmann from an original wood cut which appeared in Harper's Weekly in 1864.